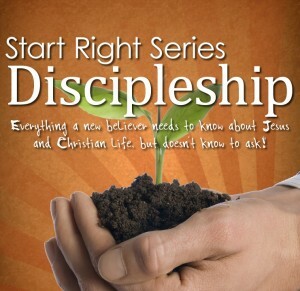 Thank you for your interest in the new and exciting discipleship program START RIGHT SERIES! It is the Father’s will that every Believer become a strong and fit disciple of Jesus Christ in every sense of the word. The START RIGHT SERIES was created for just that purpose. The START RIGHT SERIES was created to help a Believer in Christ Jesus receive a strong foundational basis in becoming a disciple of Christ Jesus. The START RIGHT SERIES was created out of a need. I saw a need in our own church. We had people coming into the church—some of them long time Christians—who had no real foundation in the very basics of Christianity. I could ask the simplest of Biblical questions and they could not answer. And, sometimes their answer was, “Well, I just love Jesus, that’s all!” However, their trite answer was usually a cover-up for their lack of spiritual maturity—never mind personal evangelism and the power of God working in and through them as Ambassadors of Christ. A disciple is defined one who accepts and assists or embraces and assists in spreading the doctrines and teachings of Jesus Christ. Many Christians I have encountered don’t even know for certain what the doctrines of Christ are! Christ Jesus is after disciples! His Believers are to be His disciples—in other words, replicate His life to others! Just loving Jesus doesn’t necessarily mean that one is replicating Jesus life to others. As a matter of fact, I feel the Christian Church has done a poor job, in many respects, at replicating Jesus’ life to others. Many have not seen themselves as disciples. More than ever we are in a time when real disciples of Christ—walking in a demonstration of the Spirit’s power are needed. As I pursued what discipleship really meant and what it contained, the Holy Spirit began to pour instruction into me. That instruction has developed into a series of discipleship books, which we are publishing as THE START RIGHT SERIES or SRS. We are collaborating with Faith Publications by incorporating into our SRS discipleship subject matter written by Kenneth E. Hagin. As you know, Kenneth Hagin is now with the LORD, but he left some great books that offer a wealth of discipleship support. Why reinvent the wheel? SRS books are simply written and easy to read, dealing with the basics of each topic. The SRS can be used by the new Believer (we highly recommend that church leaders get these books into the hands of every new believer immediately after their new birth experience) and by those who have been Christians for a while, but never really received a good strong foundation. The SRS can be used for individual study and ideal for small group study. The SRS topics of discipleship are based on everything I always wanted to know about Jesus and Christian life, but didn’t know “what” to ask! When I became a Christian in 1974, discipleship wasn’t even a thought-of subject! My discipleship consisted of the leaders of the church throwing me into a 5th and 6th grade Sunday school class to teach! Yikes! The children knew more about Jesus than I did—talk about intimidating! I know there are many, many Christians like me who did not or do not get a good Christian foundation and therefore, struggle much in their Christian walk. I am certain SRS will benefit and assist every new Believer in becoming a true disciple of our LORD Jesus Christ, living a victorious life in Him. I am also certain that SRS will benefit every church leader as they see their people becoming spiritually mature and serving Christ in great measure. In addition, SRS offers the SRS Leadership Manual for small groups. This manual contains . . .
Digital Content – PowerPoint Presentations and background slides (JPG and PNG format) for each book, flyer templates, and poster templates for advertising. Also, check out our new book for new Believers: A New Beginning!